A big rebound for AMERICAN IDOL. 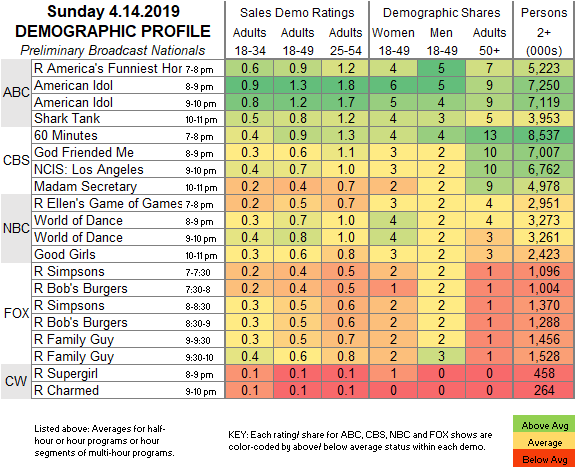 ABC: AMERICAN IDOL rose a much-needed 0.3 to 1.3. The bump didn’t extend to lead-out SHARK TANK, which stayed at 0.8. The night began with a rerun AMERICA’S FUNNIEST HOME VIDEOS at 0.9. CBS: Unfortunately for the network, a weather situation pushed the final round of The Masters back into the morning (we should have ratings in tomorrow’s SKEDBALL post), so it was long over by the time primetime began. 60 MINUTES was steady at 0.9, then the rest of the line-up returned from a week off, with the season finale of GOD FRIENDED ME down half a point from that NCAA-boosted previous episode to 0.6, NCIS: LA down 0.3 to 0.7, and MADAM SECRETARY down 0.2 to 0.4. NBC: After a rerun ELLEN’S GAME OF GAMES at 0.5, WORLD OF DANCE gained 0.1 to 0.8, and the just-renewed GOOD GIRLS was steady at 0.6. Tonight, CBS’s THE CODE has its timeslot premiere. I watched American Idol, and it was pretty terrible. I was hard to watch with Katy Perry acting out all the time, and taking camera time away from the contestants. I think the 7 million viewers was an anomaly because there was nothing else on, besides Game of Thrones. Tonight should be a different story as it is up against The Voice.